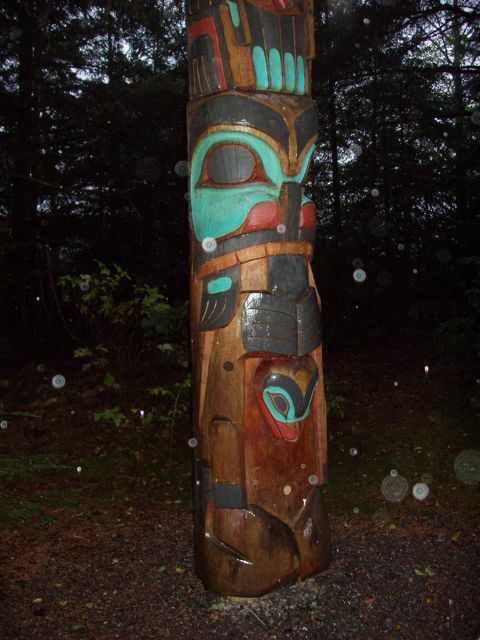 On our last night in Sitka, we went walking around town as it poured rain. 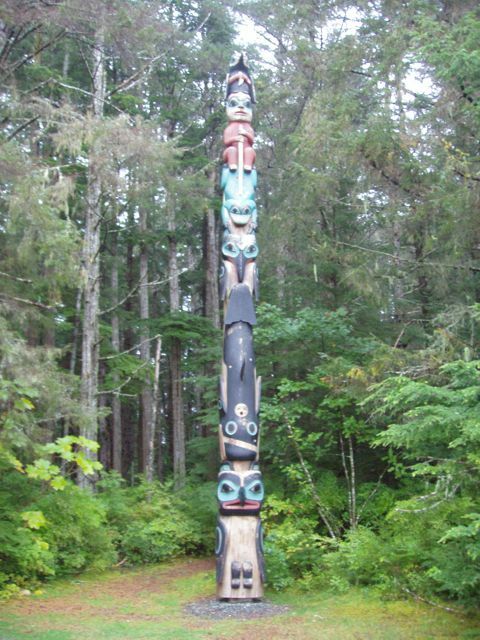 Shoot, everyone in Sitka does that, too. 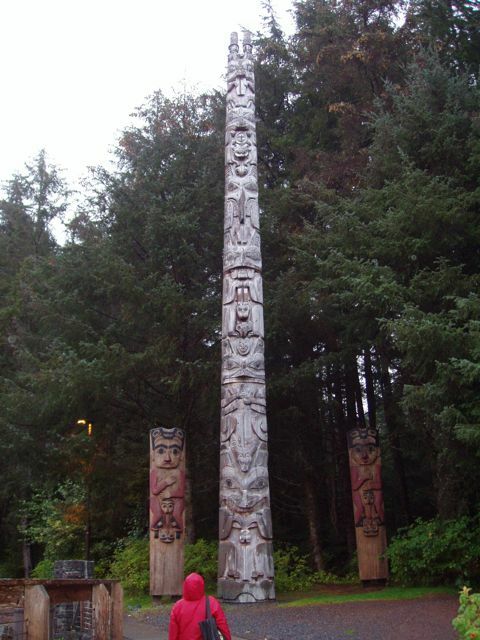 We had a lovely walk into town, saw a few of the historic sites, and toured the mystically beautiful Totem Pole Park (Sitka National Historic Park). 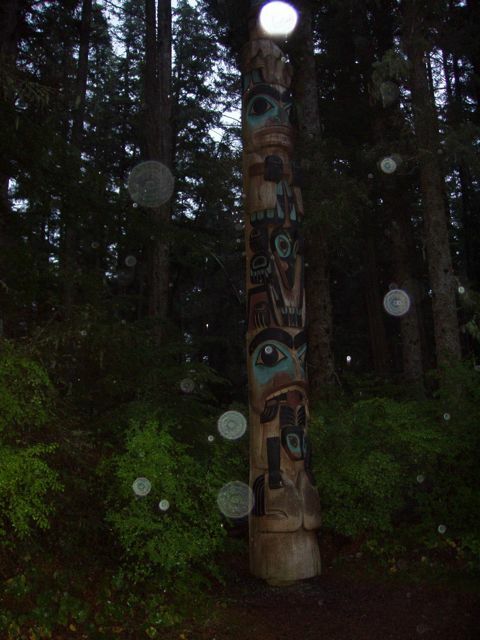 To walk that totem trail, in the rainy mist, was to walk with the Tlingit and Russians. Awesome. 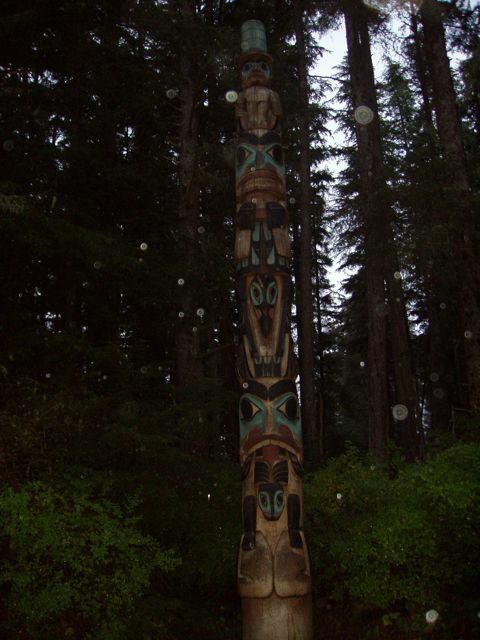 We have no idea what the totem figures mean, but they are otherworldly enough to capture anyone's attention. And, they're right here in our own back yard. 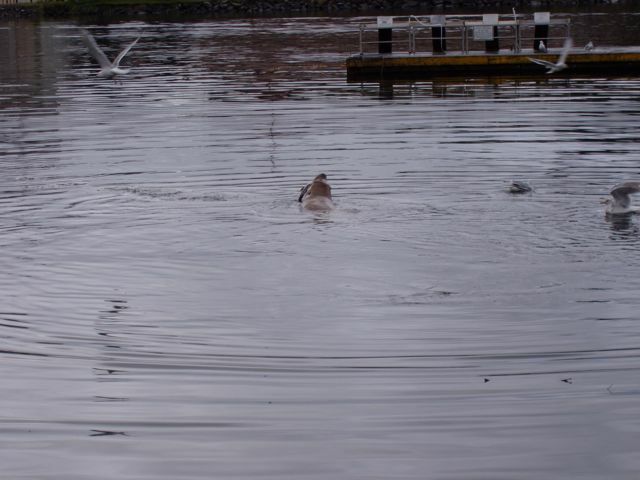 Sea lion chomps a salmon just aft of the boat. Gulls await tidbits. 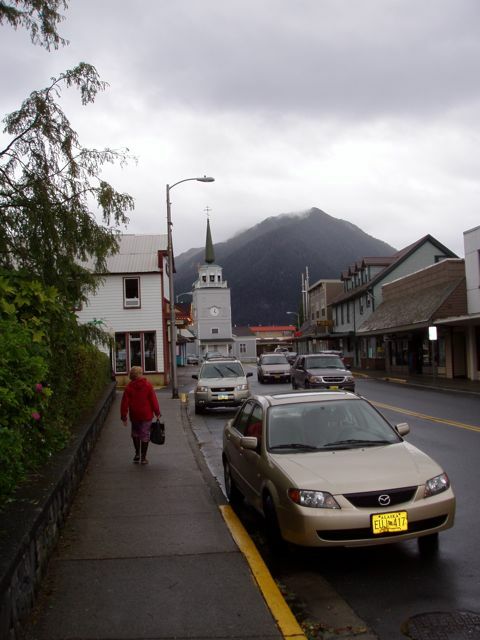 Conni tromps toward downtown Sitka. The rebuilt Russian Orthodox Church (Saint Michael, the Archangel Cathedral) is ahead of her. The new church is identical to the old church except that the clock face is white rather than black. 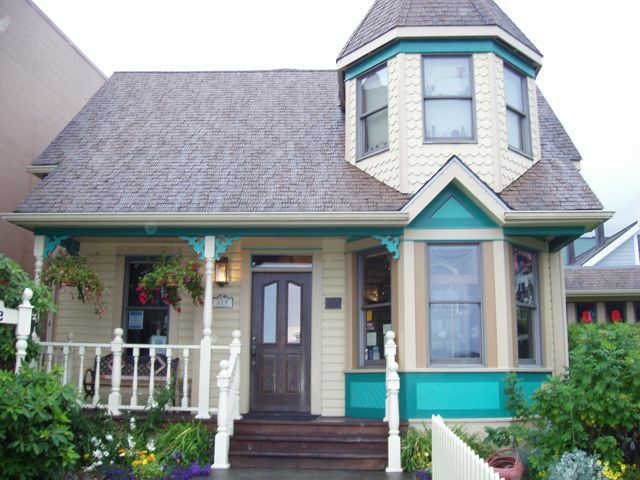 A private home, built in the early 1900s. The Russian Bishop's House is one of the few surviving examples of Russian colonial architecture in North America. Imperial Russia was the dominant power in the North Pacific for over 125 years. 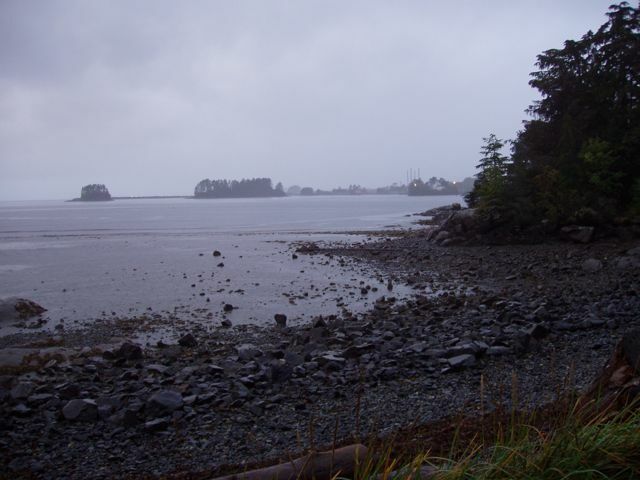 Sitka (known as New Archangel at the time) was the Russian colonial capital. 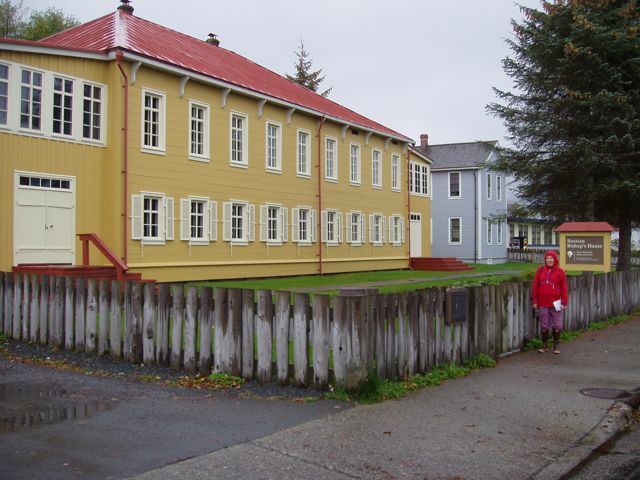 The Bishop's House was completed in 1842 and was the center of Russian Orthodox Church authority in a diocese that stretched from California to Siberian Kamchatka. Hard to imagine, now. 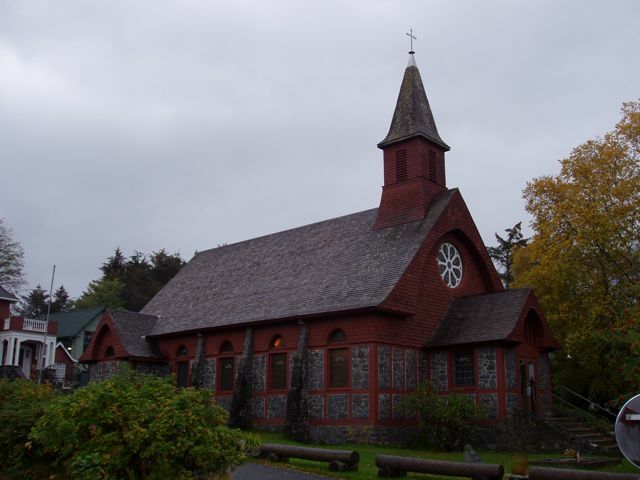 St. Peter-by-the-Sea Episcopal Church was built in 1900. What the Southeast means to me...a study in rain, fog, verdant growth, and eerie beauty. 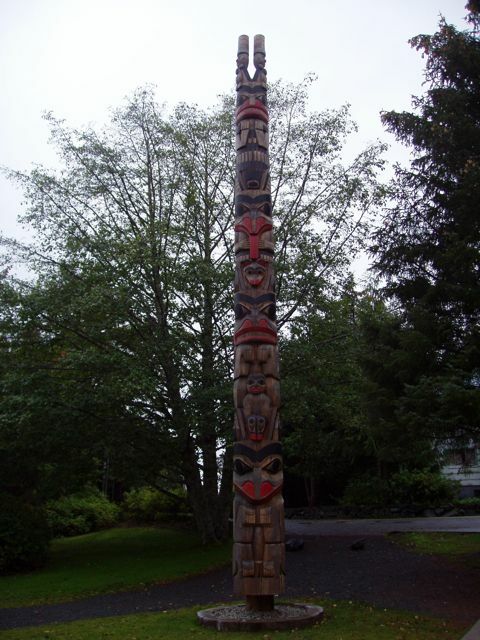 Totem at the Park headquarters. 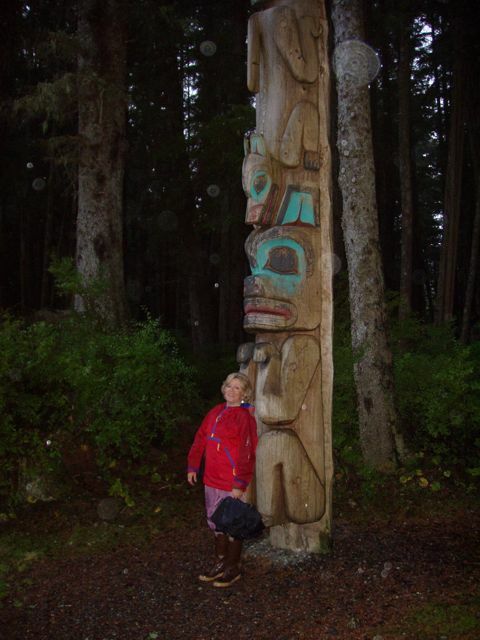 The totems in the following photos once graced the lodges of a village somewhere in Alaska. 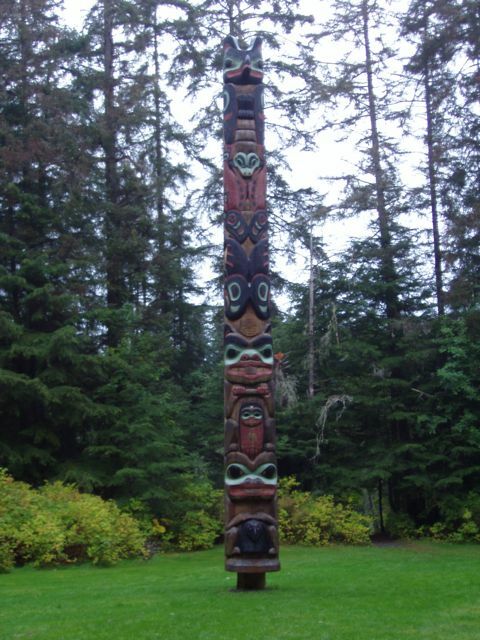 They've been uprooted and moved here to allow us all to enjoy them. 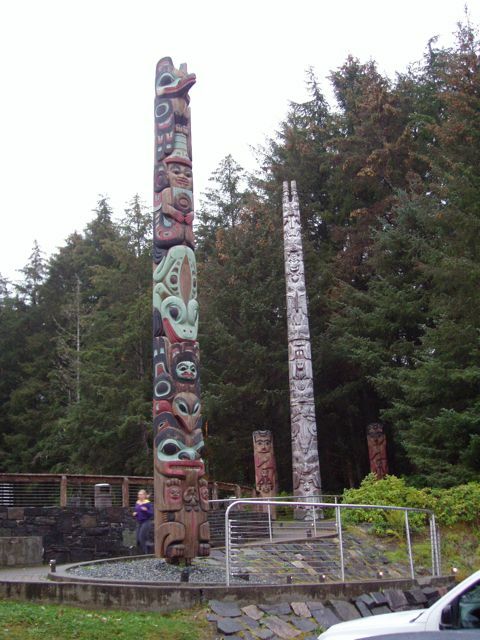 Totems at the entrance to the Totem Trail. What's that frog-looking creature? Hallucinations! 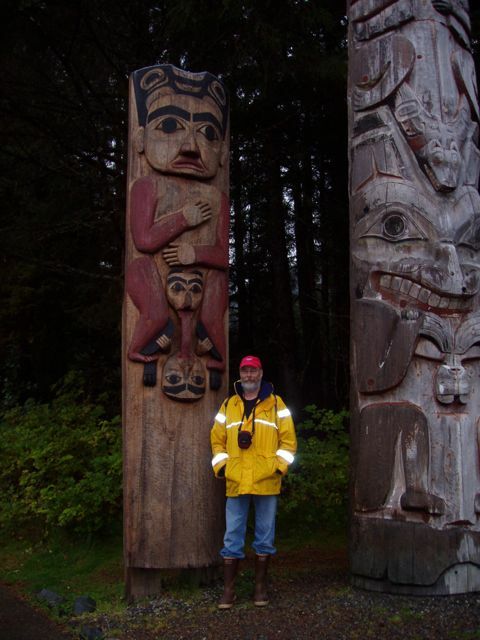 Bill stands between two totems. He fits right in. 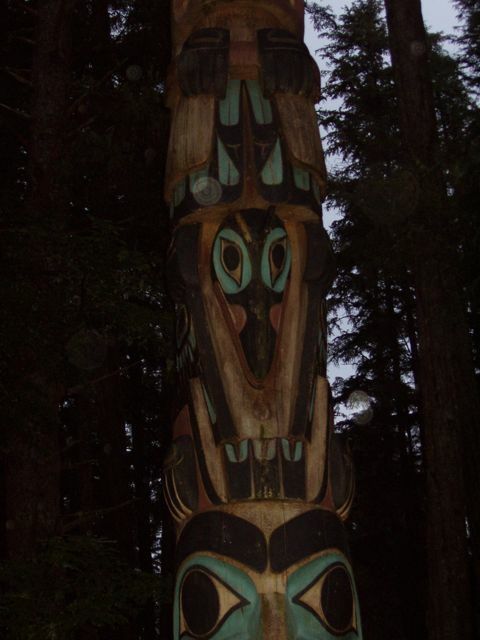 Captured by a totem creature. 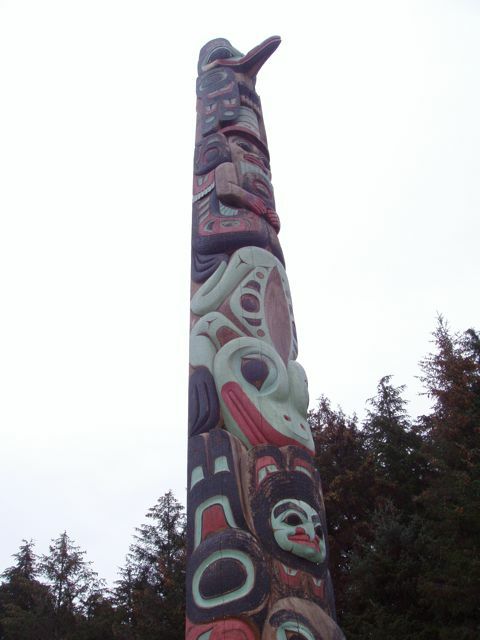 More totem. Love the "pilot bows" in the raindrops. 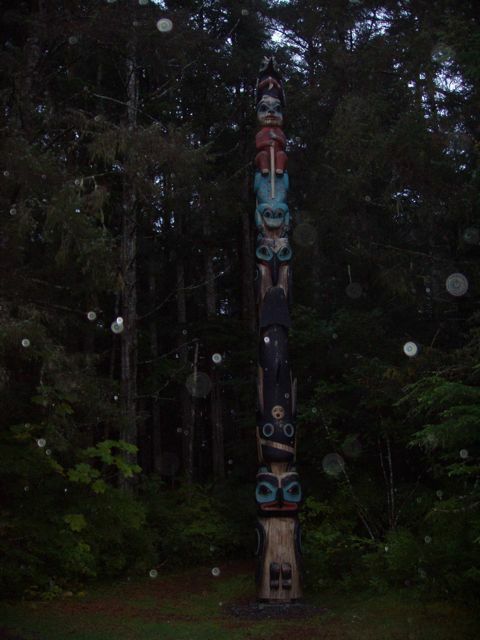 I believe that I can discern a series of "rainbow" circles, each smaller in radius. The lower creature looks like a cat. Does it? 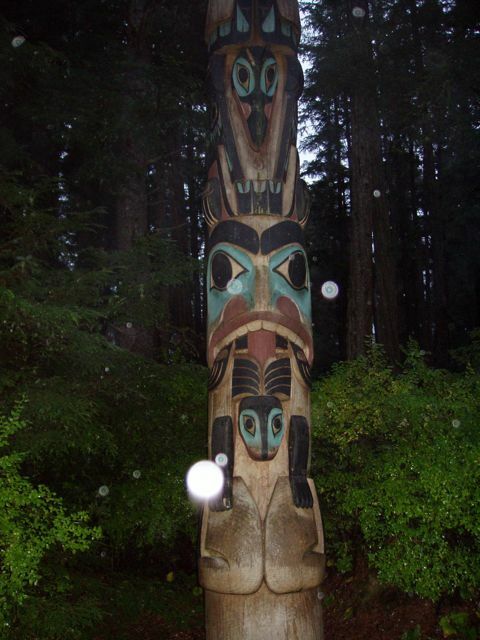 With out flash...The black creature must be a salmon. It has a vertical tail so it's not a mammal. What lovely colors. 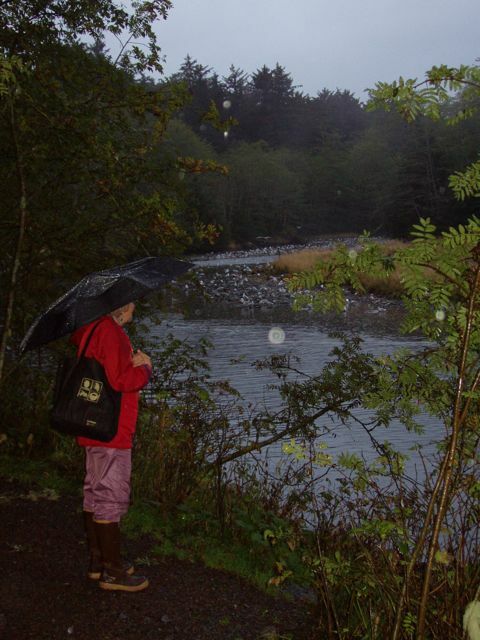 The trail led beside a salmon stream and the gulls were having a buffet of rotted salmon carcases. 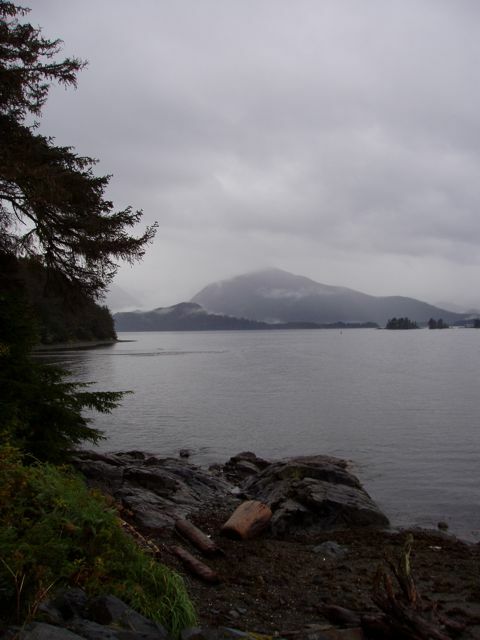 Sitka from the north. The vertical poles are the supports for the O'Connell Bridge.